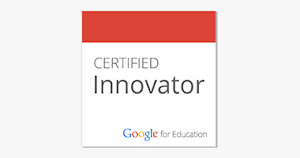 This past weekend I was extremely fortunate to attend a GAFE Summit here in Vancouver. It was a full on weekend of learning (and sharing) and I've come away with so many great ideas to try with my students. However what resonated most with me was a simple yet powerful idea mentioned in passing by keynote speaker/presenter Jennie Magiera. She spoke about using google forms to have her students "check in" with how they were feeling. WOW! This idea itself wasn't new to me, but my knowledge of Google Forms was not strong enough to actually make it work for me. That is, until I listened and learned from Jennie. The first thing I did when I returned to school was create such a form with my students and I am blow away by how powerful it has been with my young learners. Let me explain.. I started with a conversation with my students. So many of them come in with a variety of emotions each morning and are often trying to tell me all at the same time. I know it's so important that I hear these stories but my reality is I can't give each student the time they each deserve when more than one is needing me at the same time. This is where our conversation began. We talked about the needs of everyone in the class and how important it was for me to know how they were feeling, particularly if they wanted me to know. We talked about some of the ways they may feel, or what mood they may be in. We talked about how that mood may have a positive or negative impact on how they start their day and that if I can do something to help them with that, even if it's something as small as just knowing how they were feeling, that I'd like try. I set up the google form with four simple questions, two that were required, and two that were optional. The first was a required question - a name. Obviously I needed to know who was sharing with me. My students came up with the second required questions "How are you feeling". It too is a required question. It's a large list of "moods" that my students came up with including happy, excited, sick, sleepy, sad, worried, mad, stressed (yes, this came from a six year old and broke my heart to hear it), nervous, scared, frustrated, and anxious. The third question, which isn't required to submit the form, is "Why do you feel this way?". The final question is "What can I do to help?" I then created a QR code that linked directly to the form. I posted four copies of the QR code around the classroom and taught my students how to use it. They all scanned in and gave the form a try. I also let them know that they could scan the form when even they felt they needed to. I took the form a bit further (now that I know more about using Google Forms) and I colour coded certain responses so there was no way I could miss them. This is pretty easy to do in the response spread sheet. I also let my students know that I may not get to their response immediately but I would do my best to get to it as quickly as I can. So far this week it's happened with in five or so minutes, with the exception of Wed when we head to the gym first thing but I was able to sneak a peek as they were getting their drinks after gym before we settled for our morning classroom activities. It takes literally seconds to scan the form, and with certain emotions colour coded they are impossible to miss. Here are the steps of how I set up the conditional formatting based on responses . For my use I've used conditional formatting to highlight specific "moods" in a chosen colour so I can quickly see when these responses are entered. This spreadsheet is automatically created by Google when your form receives responses. Step One: Highlight the column heading - in this case the B is highlighted. Step Two: When highlighted a small arrow will show. Click on that arrow to see other options. Step Three: Click on Conditional formatting. 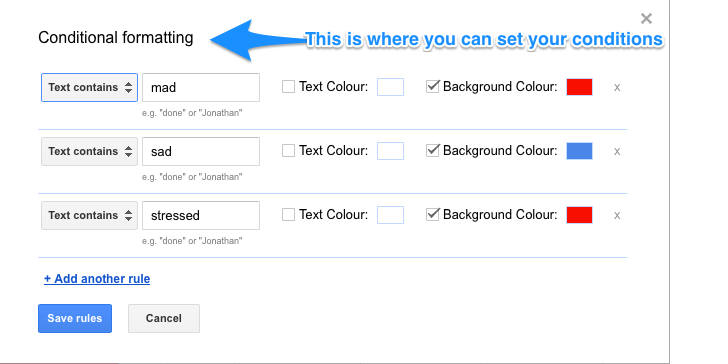 Step Four: Set up your conditional formatting. It's been in use for almost a week and I am blown away by the type of information children are sharing with me. I know that in any given moment through out the day I have children dealing with a variety of emotions. But I am also realizing there is so much I've missed because I've been dealing with crisis after crisis. This simple form is helping me get to know my students even better. In a few short days I have learned about students who are happy, mad, sad, excited, worried, sick, sleepy, and nervous. For those who are posting several times in a day I collecting data on how their mood fluctuates over the day. Since each response is time stamped I have that data too. I'm loving those who have been able to share the why behind their mood. I'm loving those who are using their voice to tell me how I can help them out. But most of all I LOVE how it's putting them in touch with how they are feeling so that together we can work towards making them feel more comfortable and able to learn. Wow! Thank you so much for sharing this! I continually add your thoughts to my professional goals - you are amazing. As usual I might need more help from you once I get started but you are always willing to help a colleague - a true professional and leader in the learning community.Thanks! Also a great, creative way for you to show your kids you care about them, that they are important to you, that they matter! Proving that there are many ways to show you care and for kids to use their voice. Kudos to you! 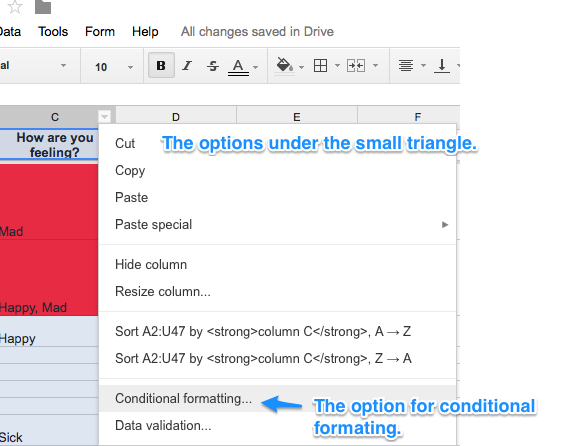 Great idea with the conditional formatting! Thank you for sharing how to do this - I learned something new! What are you doing with the responses at the end of each day? Do you delete them? Move them to a different sheet? Just leave them there and keep collecting? This is fantastic. Thanks for sharing. 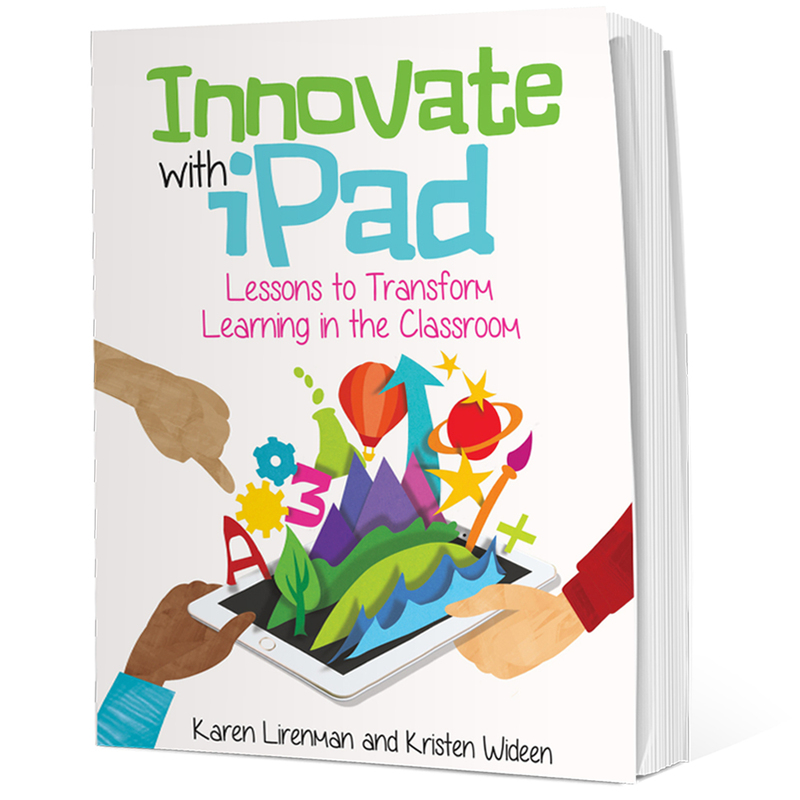 I only have two ipads in the classroom, but I think I can figure out a way for them to cycle through a check in each day. I might start with how did your week go on Fridays so I can check in with them before the weekend.